The myth of Venus – The cult of this divinity in Erice assumed different names in relation to the passing of time and the different rules. The cult of the Phoenician goddess Astarte was transformed in the cult of Venus by the Romans. It was a very special worship, sometimes incomprehensible, that included the sacred pigeons breading and the sacred prostitution in the temple. Thousands of pilgrims arrived to the sanctuary each year on the occasion of the departure of the sacred pigeons that went to Africa, to Kef, where there was a twin sanctuary and returned nine days later. During this period in Erice there were great celebrations. The myth of Venus had a large circulation all over the Mediterranean Sea especially for the sacred prostitution of the Ierodule (priestesses of Venus). Traders and navigators from all over the Mediterranean came there to enjoy the company of the beautiful priestesses of Venus that offered the protection of the goddess in exchange for considerable offers. The Anchises Stone – When Aeneas left Troia he stayed with Acestes, king of Erice, that offered him hospitality. Along the coast of Erice, near the promontory of Pizzolungo, Aeneas could bury his father Anchises in a dignified way. The Anchises Stone was erected in his honour. On the occasion of the first anniversary of his death, Aeneas organized the Ludi, a sports competition that Virgil describes very precisely in his Aeneid. Erice and Hercules – According to the legend the area was ruled by the demigod Erice, son of Bute (one of Ulysses’ comrades) and the goddess Aphrodite. When Erice knew that Hercules was visiting his territory he dared him to see who was the strongest. If Erice lost, he would have given his territories to Hercules, otherwise Hercules would have given him his sacred cows. Hercules beat Erice, however he continued its journey leaving Erice’s kingdom in the hands of its citizens. Daedalus and Minos – Invited by the Sican king Kokalos, Dedalo took refuge in Sicily after he escaped from Crete where Minos wanted to kill him because he gave his wife Parsífae the famous bronze cow. When Minos knew that Daedalus was in Sicily he asked Kokalos to hand him over. Kokalos said he would have complied with the request but actually he killed him in a bath with boiling water. The Cretans who were with the king buried him before returning home and on his grave they built a temple dedicated to Aphrodite. Some think this is the actual temple of Venus Ericina. 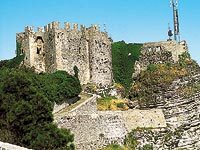 The myth of Julian the Knight – After the fall of the Roman Empire Erice disappears from historical documents. It appears again only in the twelfth century: according to Arab sources, there is a city called Gebel Hamed exactly where there should be Erice. In 1076 AD the Norman Count Roger II besieged the Muslims on the top of the mount. At dawn, during a prayer of good omen to win, he dreamed of Julian the Knight mounting a white horse, with glittering arms, a red cloak and a falcon in his left hand putting the Muslims to flight. Gebel Hamed became Norman territory and in 1167 its name was changed into "Mount San Julian" in honor of the Saint.